Bevvs can make life better from the inside out, or from the outside in. Wait, you don't soak in your favorite drink? Maybe you should start. Several bevvs have been known to promote health, wellness and beauty, and there are spas around the world ready to let you soak it up. Aire Ancient Baths is a collection of Roman-inspired bath houses. Guests pay admission to soak in pools of various temperatures from frigid to hot. Salt pools comparable to the dead sea, indoor/outdoor pools and steam rooms are also available at the coed spa. Tea and water are served around the baths, and cold pressed juices are available for purchase. 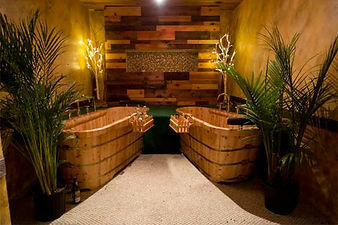 Aire offers the wine bath experience, where you can bathe in red wine! US locations include Chicago and New York. A short drive from beer haven Bend, Oregon, is Hop in the Spa, America’s first beer spa, where you can bathe in beer while enjoying a Deschutes Brewery Microbrew. Wine enthusiasts can also enjoy a beer soak while sipping over 100 wine options from Cork Cellars. Microbrews are not only rich in flavor, they pack beautifying ingredients such as selenium, iron, magnesium, zinc and vitamins B1 and B3. According to Hop in The Spa, these nutrients can ease insomnia, anxiety, stress and the nervous system. How does it work? The mixture isn’t poured straight from the tap, it’s a proprietary mash up that includes minerals and hops. Services include microbrew soaks, ale foot soaks, as well as body treatments: Get wrapped in warm linen sheets that have been steeped in an aromatic blend of herbs and hops to gently release toxins and ease tension (Hops On The Body treatment, aka the beer burrito! ), or get scrubbed with an in-house handcrafted polish of hops, barley, honey, jojoba oil and salt, then covered with hop-infused oil (the Brew & Renew Body Polish treatment). If you want to soak in some serious pivo, head to the Czech Republic. The Karlovy Vary Beer Spa has hand-made, 1000 litre whirlpool oak tubs full of Krušovice® beer ingredients (i.e brewing yeast, hops, malt grist). The 20-minute bath in the oak tub is followed by 20 minutes of resting on a wheat straw bed, which is meant to help body in absorbing all the vitamins and extracts from the beer soak. While at the spa, patrons are offered unlimited consumption of light and dark Krušovice ® beer and home-made beer bread. Following treatment, the spa recommends not to bathe for 12 hours. We’d add that you probably won’t need deodorant, cologne or perfume either - let the beer work its magic! The beer smell will be faint, however, because your skin is treated with a mixture of fragrant herbs before you leave. Japan’s Yunessun Spa Resort is a family friendly resort with waterfalls, water slides, and spa treatments. Bevvers can soak in Japanese green tea, coffee, wine, or sake. Each tub has a decorative spout, such as a continuously dripping sake cup, a 2m tall teapot, coffee and wine pouring performances, or a 3.6m tall wine bottle. The regional tea contains catechin, an anti-oxidant that also nourishes skin. The coffee and spring water soak is also good for the skin and helps alleviate fatigue. The Greenland Spa in Korea has all kinds of bevv baths, including a Jung Jong Liquor Bath. Jung Jong is a Korean liquor saved for special occasions and celebrations (like you taking a bath). Arlington, Virginia’s House of Steep offers soothing tea soaks such as the Chin Up, a mix of bergamot tea and mint, or the Clear Skies, a lemongrass and pine concoction. While you can't bathe in a tub of gin (yet), Scotland is home to the world's first Gin Spa. The gin-meets-beauty venue was inspired by those behind popular Gin 71. The Gin Spa is a great place to sip a G&T while treating yo'self.